You may have heard that a gas-burning insert is the way to go if you're looking to find an efficient and environmentally-friendly secondary heat source. But the truth is, there's an even better option. 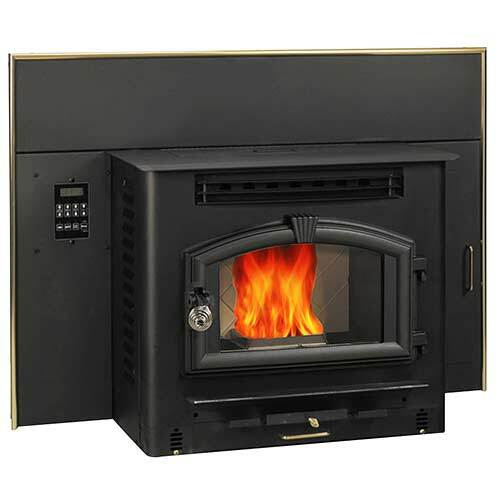 This US Stove Corn and Pellet Burning Fireplace Insert offers the same kind of efficiency and convenience as gas-fueled appliances, but with a heating capacity usually only found in wood-burning models. Really, it's true. Just look at the numbers. This US Stove Corn and Pellet Burning Fireplace Insert can use anything from compressed wood pellets to cherry pits to warm a 2,000 sq. ft. space. It produces up to 52,300 BTUs of heat per hour and features a 78% efficiency rating. Don't let yourself get tricked into thinking that you have to buy a gas appliance in order to add economical heat and an inviting ambiance to your home. This US Stove Corn and Pellet Burning Fireplace Insert is more powerful than your average gas insert and, because it uses what are essentially waste products as fuel, will cost you far less to operate. And, when it comes right down to it, why would you want to spend more money on gas? Isn't your high gas bill what inspired you to get a fireplace insert in the first place? Can you freely switch from using wood or corn? Or is there something to change out? While you must ensure that the appliance is set in "Cr" (or corn) mode when using corn, soybeans, or cherry pits, there is no physical part to change. What size opening does this fit? This insert has the following minimum opening requirements for installation inside of an existing masonry fireplace: 40" wide, 24" high, 20" deep. What is the amperage load pull on one of these US Stove Corn and pellet stoves? Can it run on any existing standard wiring? This insert will require 120 VAC for operation. Are the three facade panels included with this? The facade will be included with the insert. Is the flashing of this US Stove corn and pellet burning fireplace insert removable? Yes, this insert's surround is removable. What is the smallest opening that this insert will fit into? This item requires a width of 40 inches, a height of 24 inches, and a depth of 20 inches. This stands for both masonry and manufactured units. Can this insert be used in a pre-fabricated fireplace? Yes. Please see the bottom of page 16 of the owner's manual for more information. What are the dimensions of the firebox opening? Per the manufacturer, the door opening for this model is 16 inches by 18 inches, taken at the tallest point of the door arch. If the electricity goes out, is there a way to operate this unit manually? Unfortunately, no. Due to the many electronic components used in this heater, it must have a power source to operate. The unit can be used on generator power, as long as surge protection is provided to protect the electronics. I would recommend researching thoroughly to determine the parts you will need to install the insert. We converted a fireplace for it and had to purchase additional piping to install it properly. Installation was simple once we had all the parts. The unit is very quiet and easy to use. It provides a very attractive accent to the room. After some initial hiccups, this has proved to be a good pellet stove. We tried to order the four-inch chimney pipe, but there was some sort of problem, and we had to purchase it from another company. We also experienced some electrical issues during the installation process, but the manufacturer was very helpful and directed us how to fix a loose connection that had occurred during shipping. We use it constantly on level one or two. There is a bit of a whistling sound on the higher levels. It uses a little more than one bag of pellets each day. I have used this stove since November, about four months. It is very easy to operate with a simple on button. About ten minutes after pressing the button, heat will start being produced. There are different brands of pellets to choose from and there are significant variations between them. Some produce more heat while others go through fuel more quickly. When I realized that there were multiple fireplaces in my new home, I decided to add a pellet insert to one of them. I had previously used a freestanding pellet stove, so I was familiar with their operation. A few of the connections came loose during shipping, so I had to fix that before using it. It is doing well as the main heat source for my 2100 square foot house. It has not dropped below 25 degrees outside yet, but I expect it will continue to perform well. Wood pellets are my fuel of choice, so I really don't know how the stove would do with corn as its fuel. I would rate it between three and four stars.